So, the F5's can do all kinds of swoopy things using the iRule scripting language. I've been playing around with simple ones. The "contains" operator looks for a substring, so it'll catch "AnnoyingRobot/4.5" and "AnotherAnnoyingRobotButDifferent/mozilla". Then apply that iRule to a given virtual server, and you're all set to drop traffic from user-agents you don't like. 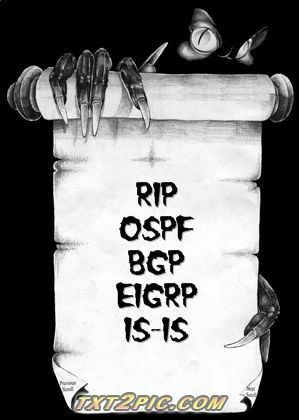 Unlike OSPF, EIGRP doesn't have the concept of "areas", so all of your internal network is lumped into a single monolithic administrative collective. Like OSPF, it establishes neighbor relationships with other routers and shares routes among its neighbors. EIGRP gives you a few more ways to tweak your routes, having bandwidth and delay instead of a simple cost metric and does route filtering a bit more granularly. Suppose you have several equal-bandwidth or equal-cost paths between a pair of routers that want to be BGP neighbors. For example, two or more WAN links between two BGP areas. You want the routers to route over both paths. The thing to do is to use a loopback address for your BGP neighbors. You must also have "ebgp-multihop" configured as well, so BGP will be okay with going to a neighbor that is not on the same subnet as itself. So, router A (AS 64591) and router B (AS 64592) are connected by a pair of WAN links. Don't forget to include your loopback network range in the "network" statement for the BGP instance. BGP is TCP based. If you're got a router that wants to share BGP routes, each neighbor has to be explicitly configured. When this is done and BGP restarted, the router opens a BGP session to each of its neighbors on TCP/179 and chats about what routes it has and what routes it can learn. If there are no routing updates, the routers exchange keep-alive packets every 60 seconds to be sure that the TCP session is still up and the routers are all happy. When a BGP TCP session starts up, the BGP neighbor will show as state "Connect" when the router is actively trying to connect. If it successfully makes the connection, it shifts to state "OpenSent" and then through "OpenConfirm" to "Established". If the router cannot make a successful TCP connection, it shifts to state "Active". NOTE: This does not mean that the connection has been made; just that it's actively trying to make the TCP connection. If your neighbors show as "Active", your routing is *not* working yet. Once the TCP session is established, the neighbor state goes through "OpenSent" and "OpenConfirm" to "Established". That last state, "Established" is the one you want to see in your summary of BGP neighbor states. The first one to look at is "State/PfxRcd": If the TCP session is up and the routers are exchanging routes, then this field will be a numeric value that shows how many route prefixes have been received from the remote neighbor. The next one of note is "TblVer", which is the routing table version. Under normal circumstances, this should be the same if routing is stable. This table (Table 41 in the same document) lists all the fields in the output and what they indicate. OSPF uses the concept of "area" to describe different chunks of the network. The center of the network is "area 0", the backbone area, and it's assumed that all areas connect to area 0. Router interfaces, not entire routers are part of an area. So a router can span more than one area -- for example, a router could have one interface in area 0 and another interface in area 1 and a third in area 199. Other routers in area 1 would then see the router as a path back to area 0. Areas can be defined as "stubby", meaning that there's only one path out from the area, and so external routes don't get advertised to the stubby area. A "not so stubby area" (nssa) can receive intra-area routes, but no external routes. Regis is still on vacation. Actual blog posts back on Weds.